In his most recent race, Dugout (Adios Charlie), won the Funny Cide Stakes by a nose over Bankit at Saratoga on August 24 in a nail-biter. The principals knocked heads from the backstretch to finish line, and the issue was decided by a photo. Saturday’s $200,288 New York Breeders’ Futurity, Finger Lakes richest stakes race, was an entirely different story. 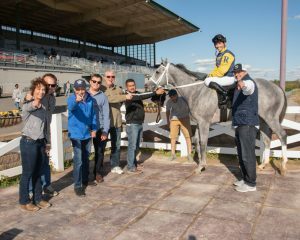 In command from the start, Dugout powered his way to a front-running 3-length victory to go a perfect three-for-three in his young career for owners Richard Ravin, Patricia`s Hope LLC and Larry Rivelli. Ravin and Rivelli bred Dugout and Rivelli is his trainer. Heavily favored at odds of 2-5 in the field of six New York-bred juveniles under Jose Valdivia Jr., Dugout reverted to the tactics he used in his July 23 debut, which he won gate-to-wire by seven-plus lengths. The grey exited his far outside post guns blazing and tail streaming and, in no time, crossed over assumed command. Gobbling up ground with powerful strides, Dugout ran the first quarter-mile in 22.10 and half in 45.27, while second choice True Gold (3-1) chased a length behind in second. A first homebred for Ravin and Rivelli and foaled at Sequel Stallions in Hudson, Dugout is the most recent foal out of Rooney Doodle, an unplaced California-bred daughter of Lit de Justice who has produced six winners from six foals to start. 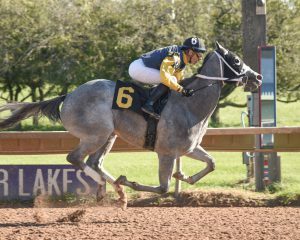 Dugout’s full-sister Jean Elizabeth is a stakes winner at Hawthorne, and half-sister Hollarforadollar is stakes placed. The mare has been bred back this year to Adios Charlie. From his trio of victories, Dugout has earned $271,423.